Playing the trading game takes audacious confidence, but winning takes more. It's about making chances instead of taking chances. As founder of the remarkably successful Taipan Group-a team of independent financial analysts-author J. Christoph Amberger knows: "There is always an opportunity to make exceptional stock market profits . . . as long as you know how to read the signs." How to profit from the "Red Zones"
In a simple step-by-step presentation, Amberger will liberate you from restrictive conventional fallacies. 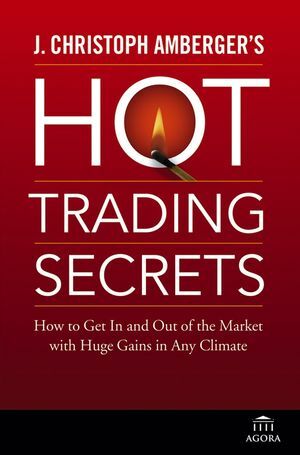 Using Hot Trading Secrets as your guide, you will learn to exploit volatile market events to achieve consistent profits-whether the market is up or down. J. CHRISTOPH AMBERGER was educated at the Freie Universität Berlin, the University of Aberdeen in Scotland, and the Georg-August-Universität Göttingen. He obtained his master of arts at St. John's Graduate Institute in Annapolis, Maryland. As Executive Publisher of the Taipan Group, he has put together one of the world's leading teams of independent financial analysts, famed for its remarkable success. A frequent speaker at international conferences, he is the author of scores of articles and special reports on financial issues, and his daily e-newsletter, 247profits e-Dispatch, is one of the most popular financial dailies in the world. Introduction: A Visit from the FBI. Part I: Dynamic Market Theory. Chapter 1. Markets Rise, Markets Fall – It Matters Not. Chapter 2. What Exactly Is Value? Chapter 3. A Story Is Just a Story … Until there’s a Profit. Part II: Crisis and Opportunity in the Global Markets of 2006 – 2009. Chapter 4. The Last Phase of the Bubble Market (2006-2009). Chapter 5. Stagnation and Decline: The Inevitable Irrelevance of the European Union. Chapter 6. Dragon Out of Fire. Part III : The Trading Secrets. Chapter 7. Trading Secret Number One: How to Profit from Cyclicality. Chapter 8. Trading Secret Number Two: The Perfect Value Trifecta. Chapter 9. Trading Secret Number Three: Follow the Money! Chapter 10. Trading Secret Number Four: "Profits at the Speed of News". Chapter 11. Trading Secret Number Five: Stone-Cold Profit Predator. Chapter 12. Trading Secret Number Six: ActionPoint Trading. Chapter 13. Trading Secret Number Seven: Profits from the Red Zones. Chapter 14. Trading Secret Number Eight: Playing the “Flying V” Lockup Indicator. Chapter 15. Trading Secret Number Nine: The Tri-Directional Indicator. Chapter 16. Trading Secret Number Ten: Trading the Money-Flow Matrix. Chapter 17. Trading Secret Number Eleven: Profiting with the WaveStrength Options Trading System. Chapter 18. Trading Secret Number Twelve: The secret Strategies of CBOE Floor Traders. Chapter 19. Trading Secret Number Thirteen: Bryan Bottarelli’s Six Trading Rules. Appendix A: The 55 Rules of Trading by Christian DeHaemer.